We want you to be able to test your AUTOSAR software and its integration as early as possible and as quickly as possible. That’s why we developed our virtual AUTOSAR basic software, EB tresos WinCore, which runs on a Win32 platform. 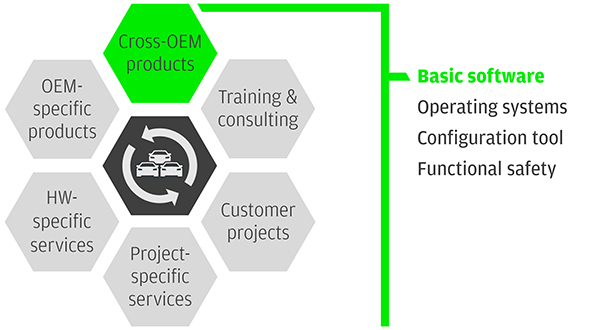 That means that you can start your electronic control unit (ECU) software project even without hardware and run your application directly on your PC. EB tresos WinCore allows you to learn the AUTOSAR standard and our tool environment, EB tresos Studio. 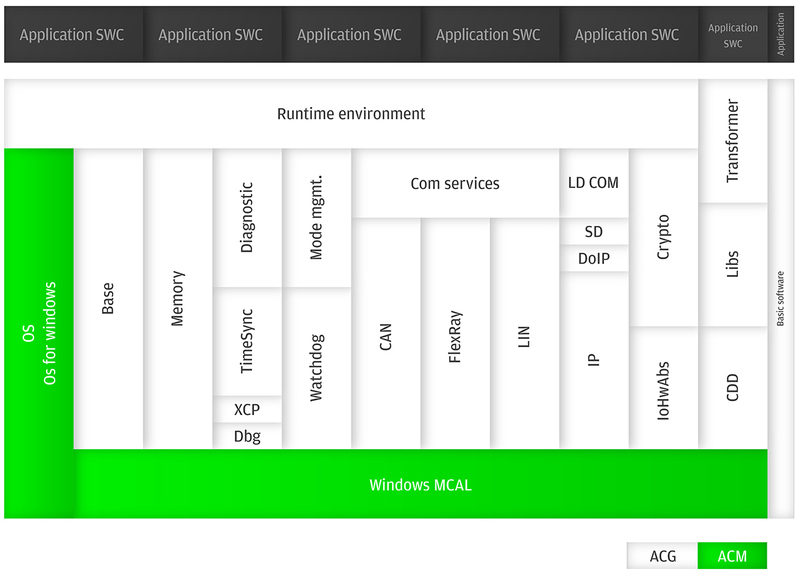 Start a mockup project and begin configuring your basic software (BSW) modules. Set simple goals such as task scheduling and diagnosis-event handling. Acquaint yourself with the workflows and configuration dependencies of the AUTOSAR standard. Start your basic software development project and carry out the complete software specification and build process, including configuration, parameter validation, code generation, compilation, and linking on your Win32 platform. Even if the actual target hardware is not ready yet or if the necessary testing tools aren’t available, you can still continue developing with EB tresos WinCore. Commission your ECU software and start testing the functional behavior of the hardware-independent parts of your AUTOSAR software directly on your Win32 platform, including your application software, independent basic software modules and Complex Device Drivers. EB tresos WinCore allows you to carry out unit tests and integration tests, focusing on the functional behavior exclusively. The virtual development saves you time and effort, letting you test functions step by step, and change parameters and test again without having to reprogram (flash) the ECU every time. The first tests with basic software on a target hardware often disclose open issues, including potential bugs. EB tresos WinCore lets you narrow down the possible sources by ruling out hardware problems. You can simply replicate your BSW configuration and build a virtual standard core to reproduce the issue on a Win32 platform. For even more in-depth tests, you can replace particular BSW modules with the test modules you specify. Modules can be swapped at every layer of the AUTOSAR stack. These test modules send and receive data from the software components (SWCs) via the RTE (run-time environment) so you can inject faults via data manipulation. Contains all hardware-independent basic software modules as used with your real ECU. Includes an AUTOSAR operating system that runs on a Windows PC. Provides Microcontroller Abstraction Layer (MCAL) in the form of stub functions. Is available for different AUTOSAR versions, e.g., AUTOSAR 4.0 + selected RfCs (= request for comment) from AUTOSAR 4.1 and 4.2. 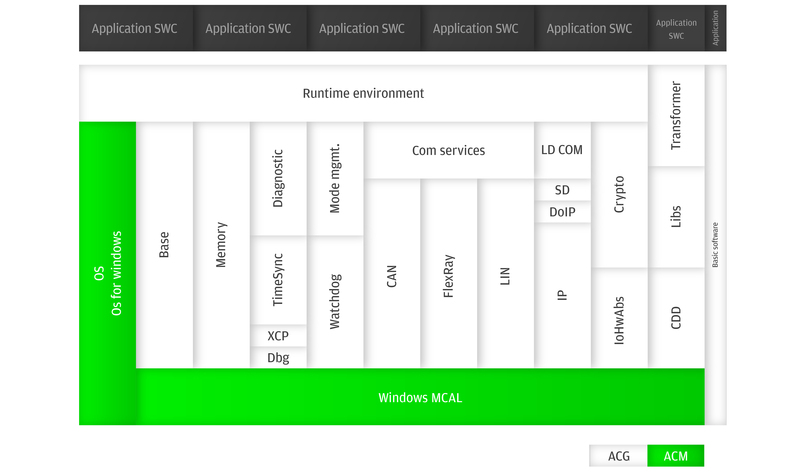 EB tresos WinCore Architecture: It includes the basic software modules contained in EB tresos AutoCore Generic (ACG) as well as an operating system and MCAL, both adapted for Windows to enable the execution of EB tresos WinCore on your PC. EB tresos WinCore includes all hardware-independent software modules of EB tresos AutoCore. Our AUTOSAR software configuration tool. The technology behind EB tresos WinCore.